Born in Miami, MB, Lloyd Orchard officiated all over Manitoba for more than 50 years from the US/Canada border to as far north as Snow Lake. 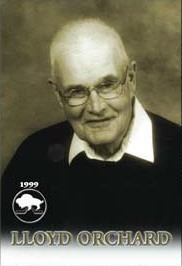 He was referee-in-chief of the Pembina Valley Minor Hockey Association from 1979-1995. His many awards include the 1984 MAHA award, the 1990 CAHA award for service to minor hockey and the 1994 Vic Lindquist Award from the Manitoba Hockey Foundation.